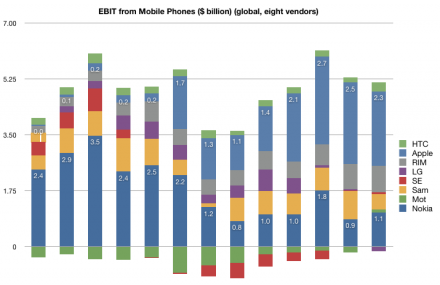 In the last mobile market update series I wrote of the evolution of market share, the shift in where dollars are spent, the tale of ASP erosion, profitability ratios over time and EBIT share over time. I did not include all vendors for various good reasons. The first survey (market share) did include an “others” category that made the volume data complete, but in the financial data sets, I chose to include the top 7 vendors that make up 80% of device volumes. 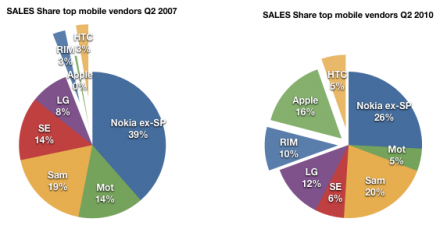 HTC has been around building devices since 2001 and so it would be a pity to exclude them from any analysis of the effect of iPhone on the market or any discussion on the effect of smartphone disruption on feature phones. The challenge with HTC was that historically their branded devices and white label devices were not reported by the company separately. This matters because white label devices are valued differently. Typically these devices are not marketed by the original manufacturer so SG&A is not applied to their cost base. Operating margins, ASPs and hence profitability is not directly comparable with other OEMs. But HTC has recently changed its reporting. Thanks to a reader I discovered that, since 2008, HTC has been listing its ASP and Operating Margin making direct comparisons possible. I still don’t have all the data, but enough to add HTC to the analysis. So, here are the 5 industry performance criteria, now with eight vendors listed. Note that HTC volumes start in 2008. The volume of units HTC sold has been increasing at about the rate of market growth. 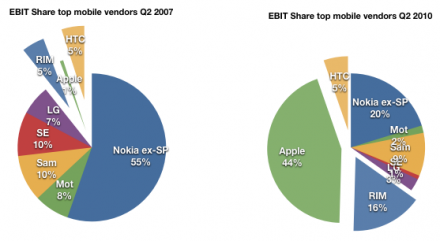 As a result, HTC’s share has not increased as dramatically as those of the other smartphone entrants. A similar story in the sales picture. 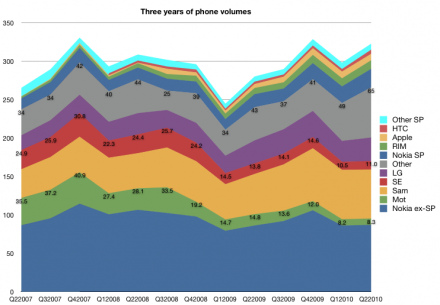 Although a consistent performer, the growth has not matched that of RIM and Apple. The pricing story is also a mixed one. 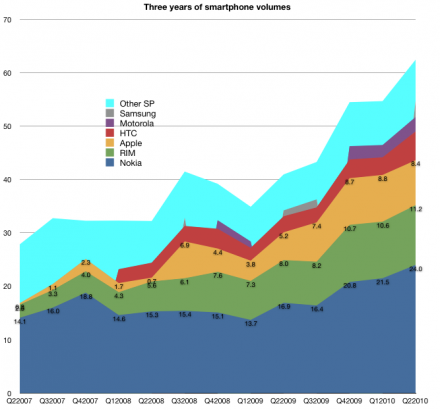 Although HTC lies between RIM and Apple in price, the erosion is more consistent with RIM and the rest of the industry. The margin story is also not as positive as one might expect. 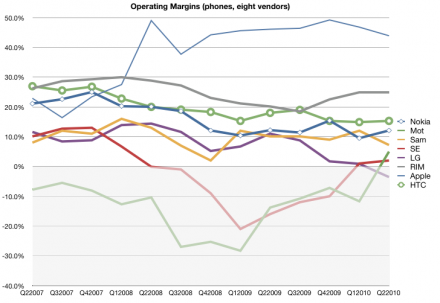 The margins for HTC started out above Apple and RIM but have dropped to closer to industry average. This is not what one might expect from an exclusive smartphone vendor. 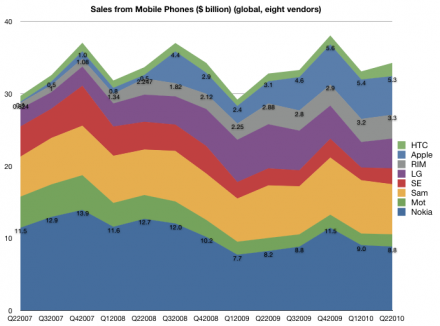 The share of earnings has remained unchanged at 5% over the period of iPhone presence. It’s perhaps a credit to HTC that they did maintain their position in the market with the massive change that has come to pass. However, here we also have to ask if HTC is riding a disruptive wave. When I wrote the last series, my definition of “loser” was a company that had faced a long series of operating losses and has no viable software assets of its own, making it vulnerable to Android (and Windows Mobile). 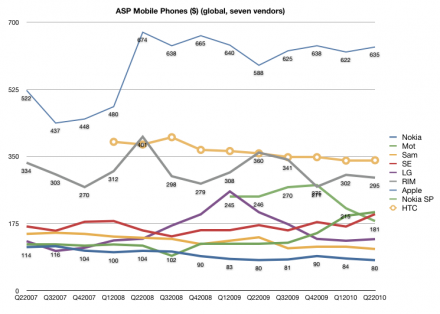 Motorola first, Sony Ericsson second and LG now coming into the picture. Nokia is not a loser in this sense since it has remained profitable and does maintain an investment in software. 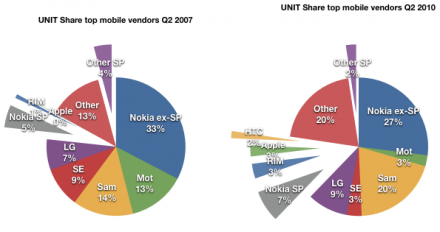 Same with RIM and Samsung (now with Bada). When/if they do have the near death experience, they might opt for the Android lifeline (flimsy as it is). However HTC does not fit the mold of either “winner” or “loser”. It’s the Goldilocks company, not too hot, not too cold. But I would add that HTC is not an example of a winner because of its adoption of Android. HTC’s dependence on Windows Mobile made their move to Android the most desperate of all. Unlike the larger OEMs, who had their low end devices to fall back on, they are completely dependent on a smartphone OS vendor. When WinMo was showing the first signs of crisis in 2007, they were the first to flee to Android (think of why they would risk the wrath of Microsoft for something so fragile as Android in 07). They are also trying hard to escape the dependence by building up their own UI (SenseUI) and I would not be surprised if they move to their own OS in the future. Being associated with Android does not confirm them as “winners” but in fact, shows their vulnerability. What does this all say about Android? Again here my thesis is that Google chose to sustain the industry rather than try to upend it. I don’t judge their motives, but the fact is that with Android, Google is not in a position to disrupt telecom. There were high hopes dashed with the Nexus One and hearts broken with net neutrality and now there are patent wars to be fought. Android, with its licensees, is still at the mercy of operators.